So, I started by putting my camera in manual mode. For this process, you are going to take several individual shots, with each one overlapping the previous one a bit. You need to make sure the exposures on these shots are as close to each other as possible. So, put it in manual mode, and find an F-stop and shutter speed setting that will give a good balance of light throughout the panorama. It will help if there isn’t really anything in the foreground of the panorama, since that can cause the software we will use to stitch together the whole image to get confused. Now, forget about panoramas for the moment, and enjoy the rest of your hike. When you get home, download Hugin. Its a free download for Mac and Windows. There are also packages available for most Linux distributions. Follow the instructions that some with the download to install it, and don’t forget to install the Control Point Generators. The instructions for that will also be bundled with the download. For the most part, I had good luck just using the Assistant in Hugin. It is a wizard that steps you through the process of creating a panorama, and uses the default values when it can. 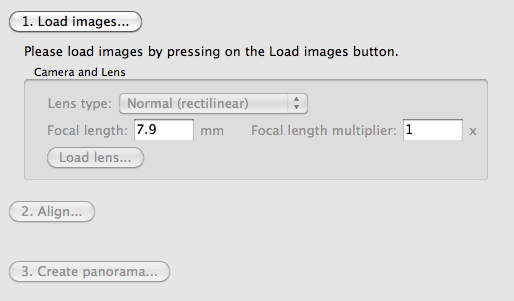 It should detect the focal length of your camera’s lens from the metadata encoded in the images. This entry was posted in Uncategorized and tagged backpacking, hiking, hugin, panoramic, photography. Bookmark the permalink. Post a comment or leave a trackback: Trackback URL.